Having totally fucked up the base set, Topps did partially redeem itself with the inserts. In fact, it’s the inserts that give 2011 Topps Lineage its name — not the completely uninspired base set that some Topps designer probably spent no more than 10 minutes on (and that includes the time it took to start the computer and load the program used to create the design). But before I move on to them, a quick word about the parallels. As with the base set, Topps really screwed up with the parallels. Did really we need more chrome refractors and canary diamond parallels? Again, the name of this set is “Lineage” — there is nothing about those type of parallels that justify the use of the that name. Hell, the retro-logo parallels Topps has been printing as a Target-exclusive for the last few years are more deserving for use in the Lineage brand than all the parallels they created for this set, save the 1975 mini parallels. What Lineage needed was more of this. Yes, I know that Topps is methodically plodding its way through its own history with the Heritage brand, but many of today’s players will be retired within 15 years. 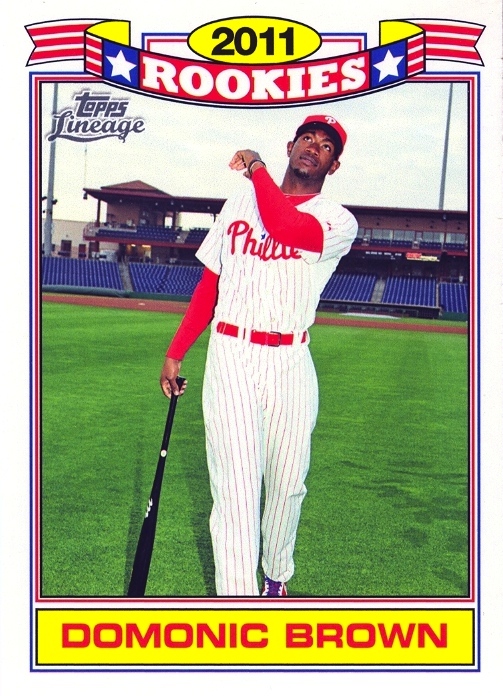 Roy Halladay will certainly not appear in 2026 Topps Heritage, appearing on a card designed to look like the 1977 set. What Lineage should have looked like was the Fan Favorites sets from 2003-2005. Randomly start putting today’s players on card designs from the past 60 years. Better still, given that Topps is virtually incapable of putting out a set without retired Hall of Famers in it, they could place those players on card designs in which they never appeared. Just imagine Richie Ashburn on a 1972 Topps card! Aside from the 1975 mini parallels, the only thing Topps got right was the inserts — which makes sense given it was the element of the set that they clearly put effort into. The 2011 Rookies set (see the Domonic Brown card above) was a nice nod to the glossy inserts available only in certain kinds of rack packs back in the ’80s and the Jumbo Box Toppers (harkening back to the ’64 Topps Giants) were equally attractive. I’d like to gush over the Stand Ups, but Topps had already mined that design for Bazooka inserts five years ago. The insert they really nailed, however, was the Reprint Autographs. 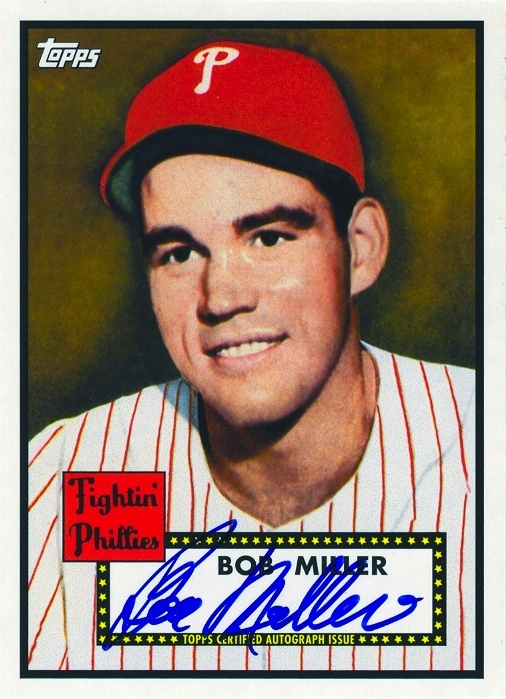 In particular, I applaud them for getting a Bob Miller autograph. I understand Topps has issues with getting retired players to sign autograph cards, but we’re now 11 years into the run of Heritage sets and there are plenty of retired players who have yet to sign autographs. Just from the Phillies, Ruben Amero, Tony González, Tony Taylor, Clay Dalrymple and Dallas Green (!) are all still alive and kicking — yet they’ve all been skipped thus far when it comes to the Heritage Real One Autographs series. I’m sure that fans of other teams can provide the names of plenty of other players deserving of an autograph card. Maybe more than anything, what Topps really needs is competition again. With a competitive manufacturer actually putting effort into a product, we’d see more evidence that Topps is actually working hard to part me from my monthly budget for expanding my collection. Seriously, Topps, I have plenty of holes in my pre-World War II collection. So long as you keep putting out product like this, I’ll have plenty of spare cash to spend on putting together that low-grade T206 Phillies team set. Current database progress: 9,400 entries (lines); last set information entered: 2005 Playoff Absolute Memorabilia.